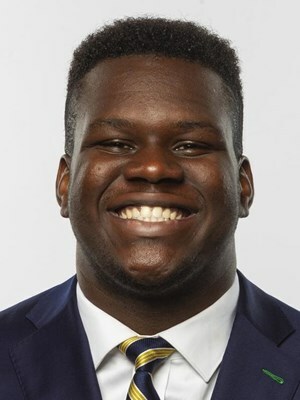 Micah Dew-Treadway, a defensive tackle who completed his junior season at Notre Dame in 2018, announced Tuesday morning on Twitter on that he has committed to transfer to the Gophers program. “What if I told you God gives second chances? #committed #RTB,’’ Dew Treadway tweeted. Dew-Treadway, a 6-4, 300-pounder, is expected to be a graduate transfer, enroll at Minnesota for the spring semester that begins Jan. 22 and be eligible to play this fall. Dew-Treadway played in 11 games for Notre Dame in 2018, making two tackles as the Fighting Irish went 12-0 in the regular season before losing to eventual national champion Clemson in the College Football Playoff semifinals in the Cotton Bowl. He played in nine games with no statistics as a sophomore in 2017 after missing the 2016 season because of a broken foot and spending the 2015 season as a redshirt. A three-star recruit out of Bolingbrook (Ill.) High School, Dew-Treadway was the nation’s 29th-ranked strong-side defensive end in the Class of 2015 by the 247Sports.com composite of major national recruiting services. He had scholarship offers from nine Power five programs, including Indiana, Maryland, Purdue and Wisconsin of the Big Ten. He also received an offer from Western Michigan, which was coached by P.J. Fleck, now the Gophers coach. Dew-Treadway visited the Gophers over the weekend, along with Southern California wide receiver Randal Grimes, who announced on Sunday that he was transferring to Minnesota.